One of the wonders of nature is the variety of ways in which different species develop defense mechanisms in the evolutionary battle for survival. At least three creatures in particular have adapted the ability to attack using their saliva: Cats, Komodo Dragons, and the NBA's Wilson Chandler. This is Dewey, being shown a little too much affection by my boy Sam. Judging from the picture, you would expect Sam to be Dewey's biggest threat, right? Surprisingly they get along fine. You could even say they LOVE each other. The other cats in the neighborhood, however, are not so fond of their newest rival. A few weeks ago we heard a commotion in the front yard and the next day Dewey's front leg swelled to about 3 times it's normal size. We learned from the veterinarian that cat bites can be quite vicious. In fact, 80% of people who are cat-bitten will become infected! This animal may very well have more biodiversity in the oral cavity than any other creature out there. It certainly has the most virulent strains of bacteria, causing immediate sepsis in bite victims. Somehow the Komodo dragon remains unharmed from the bacteria in it's own mouth, but how it does this is still unknown. Just know that if you ever find yourself confronted by one of these bad boys, don't let it bite you. This injury went from something that I thought was going to be a two-day situation to all of a sudden they were saying “we might have to cut your triceps muscle and you’re never going to play again” to “you’re fine”. It was a very scary situation, and I learned how serious infection can be. It got to the point where they said if we can’t find the right antibiotics to counter the bacteria that you’re going to have to start getting things cut out of your arm, and you may never have the same arm to play basketball again. Scary stuff! You know what's also scary? The picture of his elbow recovering from the injury. Kids, remember to wear your mouthguards - not just for your own safety but for that of your opponent! Here's a great story to keep in mind while your cheeks are nice and rosy and you're getting comfy and cozy this holiday season! Being a dental professional, it's no surprise that news items related to kissing show up on my radar from time to time. A few years ago in Romania a couple was experimenting with a "special type of passionate kiss" and the woman accidentally swallowed her lover's dentures! Also, every so often there will be a news story claiming how kissing is either good or bad for your teeth. (Personally, I think your dental health shouldn't really be a deciding factor when deciding whether or not to kiss somebody). So there they are, she on the potty, he standing near her, they begin their little kiss and things start heating up (of course, why wouldn't they?). She gets a little frisky, when all of a sudden she decides to take the freaky to a whole new level and bites off his freaking tongue! The poor romantic fellow then found some gauze to stop the bleeding and called the police, who arrived to find Karen doing exactly what you would expect her to be doing in this situation - singing Christmas carols and blowing into a New Year's horn. One of the officers (probably not a very romantic one) had no idea what was going on so he asked what sort of assistance was needed. The result? She blew the fancy horn in his ear and threw a coffee cup at the police. The result of this all is that Karen is currently charged with felony mayhem that has to do with intention to mutilate or disfigure. At this point all we know about poor Willard's condition is that he was sent to the hospital with his severed tongue where doctors worked to reattach it. The full, sad, scary story can be found at the Sheboygan Press. Last week I met a new patient who, as it turns out, was actually a very familiar old friend. Upon meeting him I discovered he was a nice jolly elderly man with a long white beard. A younger dental ninja would have recognized him immediately, his street clothing notwithstanding. Yet in my present condition as a grown-up, I didn't realize who he was until he informed me that he would be seeing many children at the mall during the next few weeks and that he didn't want a toothache to keep him from this vital task. While waiting for Santa to get numb, I made casual conversation and mentioned how excited my sons would be to hear that not only did I see him, but I actually fixed his tooth! 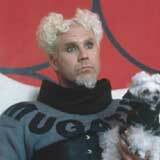 Also, it wouldn't hurt to name-drop and let it be known that our dental practice serves such high-profile clientele. Once Kris Kringle was good and numb I got to work removing the root of his mandibular canine. The adjacent teeth had enough gum disease that I thought it wise to attempt the extraction without elevating (using the other teeth for leverage). My plan worked beautifully except for one small hiccup - I had such a firm grip on the forceps that once the root was sufficiently "loose" it slipped out of the forceps, came flying out of his mouth, and ricocheted off my chest and leg before coming to rest on the floor! The good news was that I had removed Santa's tooth, and he was on his way to a speedy recovery and a holiday season free of dental pain. The bad news was that I now found myself sitting there with Santa's blood on my light blue scrubs, and I still had a few more patients that day (including some little kids). Luckily the extraction happened so quickly that I had plenty of time to go home and change. On the way home I couldn't help but feel like the worst super-villain around. Think about it, if you saw some guy walking around with a bloody shirt you would wonder, but if you knew that the blood belonged to St. Nicholas? Yeah, pure evil. Thus is the plight of the dentist - willfully enduring the label of the bad guy when his only intention is to help others. When you get your Christmas presents on time this year, along with Santa Claus, you can thank your dental ninja. PS, I realize that by naming Santa Claus in this post I am in clear violation of HIPPA, so Santa, if you're reading this, all I want this year is for you to not sue me for sharing your private health information. Well, that and a Red Ryder BB gun. Being the dental ninja, I keep a close eye on any news stories relevant to dentistry. Some of the more interesting or amusing stories I pass along to you, the reader. However, there are many news items I pass over simply because they are frustrating for me as a dental professional. These stories usually involve my colleagues who break and abuse the trust their patients have given them. Take this pervert or this cheapskate, for example. It seems like once or twice each month another dentist is getting our profession the wrong kind of publicity. Occasionally I skim through the comments posted online in reaction to these stories. A few that stick out to me are one man claiming dentists are no better than used car salesmen and that money is the only topic discussed in continuing education meetings. Other comments have offered dental advice, claiming that if a tooth needs a root canal you might as well pull it because those never work! After reading enough of these you'd get the feeling that the public doesn't trust dentists as much as they used to. While 80% is not as high as I'd like to see, it's not too shabby, especially if you consider the segment of the population who don't trust anyone! Hillary Duff's Dentist Saves the Day! 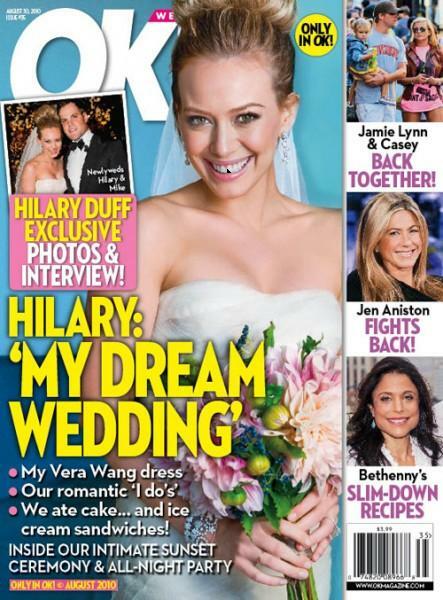 Perhaps as a testament to her compatibility with her professional hockey star hubby, Hillary Duff began her wedding day by CHIPPING a TOOTH! She explained to OK magazine, "I started my day with a chipped tooth! My wedding planner snuck me out to the dentist! Thank goodness it was fixed within the hour." I'm sure the dentist didn't mind coming in early on a Saturday to be the hero. It's emergencies like this that help make being a dentist worthwhile. Rather than complaining that they have to see the dentist, emergency patients are typically very appreciative of what you do. Maybe she woke up in the mornin' feelin like Lil Jon. Maybe this was a result of hitting her head against the walls. Either way, her judgment must be getting kind of hazy, because pop star Ke$ha recently opted for the shiny gold crown on her right maxillary canine, as reported in theblemish.com. This week we'll take a look at various things passing through various mouths. First off, as of late I've noticed a pretty cool trend in the medical field - surgeons are using the oral cavity as an entry/exit to the abdomen in general, thus avoiding those unsightly post-op abdomen scars. Recently at UCSD, surgeons utilized NOTES (Natural Orifice Translumenal Endoscopic Surgery) to remove a gallbladder. Very minute incisions were still made in the abdomen for a camera and light, but the organ was removed via the mouth. NOTES has also been used at the UCSD medical center to perform a sleeve gastrectomy. Basically, 80% of an obese lady's stomach was removed in order to help her feel full after eating less. My recommendation? Just imagine 80% of your stomach being removed through your mouth right before dinner and you'll lose your appetite without having to go through this procedure. Read more from the LA times and foxnews.com. Our next story comes to us from Svalbard, which, surprisingly is NOT the name of a piece of quaint, affordable furniture from Ikea, but rather a place in Norway where Arctic explorer Sebastian Nissen recently awoke to discover his head INSIDE the mouth of a polar bear. Gadzooks! Either that bear was very gentle (or sneaky like a ninja) or Sebastien was a little to wasted to be off exploring the Arctic. (Or maybe "exploring the Arctic" is just what the Norwegians call getting drunk in the wilderness). Either way, the only insights we have into this episode are that Sebastian awoke, head in mouth, the bear then stood up, and Sebastian's friend shot the bear dead. During the estimated 60 seconds spent inside the bear's mouth, our hero reached for his shotgun only to find that the bear had wisely snapped the weapon in half. Again, I'm not sure if this supports the theory that the bear was a clever ninja or that Sebastian was drunk off his ÅNES. (That actually is a piece of furniture from Ikea). I could imagine this guy waking up to find his head inside of his own mouth. The teeth were expected to go for a mere £5000. 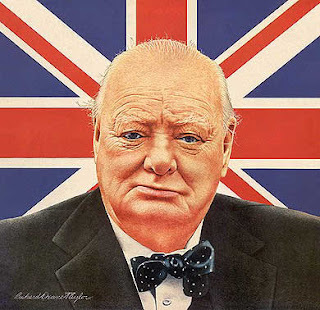 Churchill claimed to have had terrible teeth and gums and needed complicated dentistry even in his childhood. Churchill appreciated his dentist, Willfred Fish, so much that he nominated him for knighthood. I will name my next pet fish Willfred. Willfred Fish's lab technician was drafted to serve in WWII, but Churchill personally intervened stating that the lab tech would be more important to the war effort if he stayed in London to repair Churchill's dentures. Most babies resemble Winston Churchill. This doesn't have to do with his teeth, but it's worth mentioning. Seriously, look at him, now look at a baby. You see? And just to be clear - I'm not saying he looks like a baby. You don't look at him and think, "wow, he looks like a baby". No no, it's the other way around - babies look like him. If I get Vampire Teeth, maybe then Edward will Notice me! We've been hearing over and over again how this is the worst recession since the 1930's - which very well may be true, but it doesn't really seem that bad when teenage girls are dropping $200 to get vampire teeth. In defense of the dentist, he isn't really doing anything different from other forms of "cosmetic" dentistry - he's just making her smile look worse, not better. Than again, beauty is in the eye of the beholder, right? And when the beholder is a desperate teenage girl who dreams about Edward all day, beauty ends up looking like vampire fangs. In a way, this is nothing short of anti-cosmetic dentistry. Here's the full story from jsyk.com. First, researchers at Boston U's dental school have concluded a prospective study which showed that for each tooth lost, the ability to perform well on a cognitive test decreased 8-10%. Scientists are hypothesizing that the decline could be related to the inflammation that accompanies tooth loss. Other studies have shown elevated inflammation markers in people who have Alzheimer's disease. The study was published in the Journal of the American Geriatrics Society. Story from physorg.com. Need some proof? Look no further than Highway 402 in Ontario, Canada; where a trucker was recently charged with careless driving for performing some good old fashioned do-it-yourself dentistry on the go. (I guess this is actually a case of decreased cognitive ability during tooth loss, not after). The plan was to tie one end of a string to the roof of the cab with the other end around his tooth and then to wait for "one good bump" to pull it out - which is exactly what happened. The lone hiccup in his plan? The fact that he was "traveling erratically" as reported by another driver. Full story from CBC news. Apparently we need a few more truckstop dentists out there! Seriously though people, driving under the influence of dentistry is a careless and selfish act that endangers everyone around you. Just avoid the temptation altogether. When you know you'll be driving, make sure you hire a designated dentist. Or if you're going to be doing dentistry, find a designated driver. Either way works. Hamstring issues? Let's remove those teeth. If you follow Australian Rugby, then you don't need me to tell you that Rod Davies plays for the Queensland Reds in the Super 14 competition. Nope, I just mentioned that for the benefit of the rest of us who don't watch quite as much Australian Rugby. Lately Davies has been having his on-field struggles with hamstring injuries. One of the solutions being considered is having his wisdom teeth taken out. What's that you say? For his hamstring injuries? That's right. Now, before you dismiss the dentist as a quack (as I almost did when I saw the headline), bear in mind that there is some sound logic at work here. The explanation is thus: if an individual has persistent pain in the mouth, this can cause them to hold their head at an unnatural position in an attempt to alleviate some of the pain. This places unnecessary strain on the spine, which in turn can contribute to pain in other areas. A personal anecdote also supports this theory. The first tooth I ever extracted in my school's dental clinic was a maxillary canine. It took a few minutes, but when the tooth came out, the patient began moving his head around in circles. His face lit up as he looked at me and told me he hadn't had full range of motion in his neck for the past year, but now everything was fine! Even though I had no explanation, he was incredibly appreciative of what I had done for him. Hopefully this doesn't become a trend, however. I'd sure hate to see a teenager come in to have all their teeth taken out for athletic reasons. Although I guess it would help them jump a little higher. Full story from fox news. Classic! I love when parents can help the kids get over the fear of losing teeth (and dentistry in general) by doing things like this. Who knows? Perhaps grown-ups who come in for extractions would elect for the super-awesome "Rocket Extraction". I know if I had to lose a tooth, launching it with a rocket might make me feel a little better. Dentists have always been unfairly represented in entertainment media. Admittedly, we're an easy target - many people fear the dentist, so audiences can appreciate when the local DDS isn't normal, whether he or she is simply a sadistic weirdo or someone who's OCD behavior has pushed them over the edge. Continuing in this trend, albeit with a new twist, it was announced this week that Jennifer Aniston is going to star in an upcoming comic-murder-thriller entitled "Horrible Bosses". The twist? Her role is that of a dentist who suffers from the same addiction Tiger Woods has. Critics are calling this her raunchiest role yet. Sounds like a winner. Not really. There is some hope on the horizon, however. Last week it was announced that Hollywood heartthrob Uncle Jesse (aka John Stamos) will be starring as a dentist in season two of Glee. John Stamos? As in, the handsome devil I practically see when I look in the mirror? That john Stamos? Sweet. Please Hollywood, let his character be a good dentist (or at least a normal one)! I'm a little skeptical because he's supposed to play the rival love interest of the main guy who teaches the kids how to sing and dance (I don't watch the show, but my wife does so I'm somewhat familiar with it). Since Uncle Jesse is going to be the "other guy" the producers may see fit to give him a quirk or two in order to keep us from rooting for him. Stay tuned! Losing a real tooth in a fake fight? Priceless. We all know that playing hockey can be hazardous to your teeth, but what about professional wrestling? While you're thanking the performers "for all that you've done to your bodies", be sure to thank John Cena, who recently sacrificed one of his pearly whites in his bout vs. Batista. Cena tweeted that he spent 3 hours at the dentist the next day. This of course begs the question, did Dwayne "The Rock" Johnson visit him that night? Suppose you're a nice young lady being chased through the streets of Japan by a would-be attacker. Since you regularly read The Dental Ninja you know that ninjas are awesome and that the best way to get out of this situation is by being a stealthy ninja - but how? 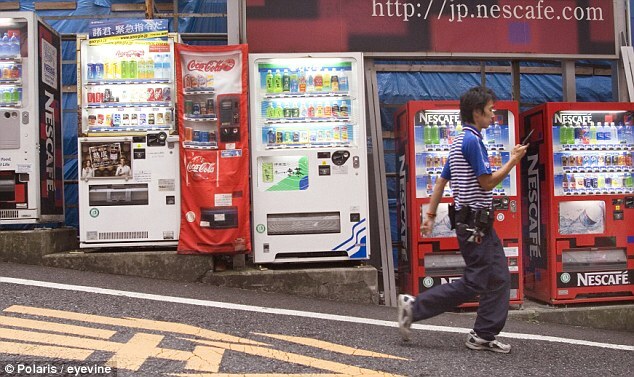 If you have the skirt from fashion designer Aya Tsukioka, you blend in as a Coca-Cola machine! Can you spot the damsel in distress? Viola! Her utility-belt-wearing, texting-while-running, would-be attacker is THWARTED! Read all about the fancy ninja dress and see more cool pics at the Daily Mail. Speaking of ninjas, it's not cool to dress up as one and slash a teenager's forehead open while claiming to "protect the woods" - unless of course there is more to the story and you truly are protecting some mystical treasure, in which case, my apologies. But otherwise, seriously not cool. Much like this blog, the comics play on the unique knowledge and experiences we in the dental profession share. Head over to dentalposterart.com for more, as well as some deals on vintage dental related posters. Ok, maybe not so much, but on the bright side, look how far we've come as a profession! This sounds like a bad sci-fi movie, but three years ago scientists discovered a new animal - a leech with HUGE teeth, in the unlikely location of a 9-year-old Peruvian girl's nose. "So, tell us something interesting about yourself"
"They discovered a new animal in my nose once"
As far as leeches go, this one was so fierce it was dubbed Tyrannobdella Rex a.k.a. the tyrant king of the leeches. This isn't the only leech with dentition, but the chompers on the tyrant king are 5 times larger than any other leech. The teeth only line one jaw, and the tyrant uses them in a sawing motion to open up a wound and cause bleeding. How do I know if a tyrant king is living in my nose? Victims typically report a frontal headache. So, next time you are in Peru and have a headache, just think - maybe there's a king in your nose! Dr. Jason Bodnar is afraid of bridges. I know what you're thinking, a dentist? Afraid of bridges? And no, I'm not talking about bridges of the dental variety but rather the traditional "bridges" people drive around on over water. (Although he quite possibly encourages patients to get implants instead of bridges because he doesn't like the word "bridge". He didn't say that, I'm just thinking this might be the case). Despite this fear, Dr. Bodnar ran 7 miles in just 37 minutes 43 seconds to win first place in the race dubbed the "Seven Mile Bridge Run" - the entire course taking place on a bridge. How did he do it? "....when I'm running, I stay toward the middle and don't look side to side." He may be onto something here. Imagine how much faster you would run if, during the race, you were accompanied by your biggest fear but you knew that upon finishing, the source of anxiety would be gone? Don't be surprised if this becomes a popular trend, and you soon see marathon runners being followed by spiders, snakes, and maybe even a dentist or two. Full story from USA Today. I'm sure dental students everywhere can appreciate this little diddy done by dental students at MUSC. This news item made me realize that no matter how difficult it is to get a good look at the teeth of a small child - it could always be worse! Recently the Loyola University Medical Center donated a CT-scanning machine to the Brookfield Zoo. This enabled the zoo's veterinarians to finally do a thorough evaluation of the teeth of an aardvark. Apparently tooth decay is an issue with elderly aardvarks. In the wild, they typically live around 10 years, which generally isn't long enough for tooth decay to become a major problem. However, in captivity the animals do much better and can live as long as 30 years, during which time tooth decay is typical. Full story from the Chicago Tribune. One of the most distinctive characteristics of the Tubulidentata is (as the name implies) their teeth. Instead of having a pulp cavity, each tooth has a cluster of thin, upright, parallel tubes of vasodentin (a modified form of dentin), with individual pulp canals, held together by cementum. The teeth have no enamel coating and are worn away and regrow continuously. The aardvark is born with conventional incisors and canines at the front of the jaw, which fall out and are not replaced. They are the only remaining species on earth to exhibit tubulidentata. Last December I passed along some gossip from a tabloid which stated that the wife of Tiger Woods performed an extraction on one of his incisors using a cell phone from across the room. This she did in her fury after, you know, finding everything out. As the master golfer returns to his sport, it seems that at least one fan has noticed a difference in his smile. Notice the slight darkened appearance of #9. Perhaps there is some truth to the rumor? It's not the best quality picture but one can certainly speculate that the central incisor may have been avulsed and replanted. Incidentally, if you plan on playing "Tiger Woods PGA Tour 10," or any other video game for that matter, perhaps you would be wise to first read about the new research from the University of Iowa showing a correlation between the amount of time spent playing video games and the incidence of tooth decay. Apparently hard-core gamers are more than twice as likely to have tooth decay than people who lead more active lifestyles. An important figure in ninja folklore is Kumawaka - a 13 year old boy who used what would eventually become key aspects of ninjutsu (namely stealth, cleverness, and deception) in avenging the death of his father. Recently, an oral surgeon in Washington, Dr. Clem Pellet, similarly tracked down his grandfather's killer using the not-so-ninja-like qualities of persistence and hiring a private detective. It turns out that the man escaped parole in 1969 after serving a 15 year prison sentence, completely vanished, and was recently re-discovered operating a wedding chapel in Arizona. Actually, Dr. Pellet seems even less like a ninja when he was quoted as saying, "I'd like to talk to him. What happens to him is up to the justice system. He's 78-years-old. I just have no animosity towards him at this point." Either way, the Dental Ninja salutes you, Dr. Pellet, for your excellence in both dentistry AND criminal justice. Read the full story from the king5.com local news. Recently in a Zurich, Switzerland zoo, a zebra laughed in the face of death as it spent 15 minutes cleaning the teeth of a hungry hungry hippo. FYI, the hippo is the third largest animal in the world, can open it's giant mouth 150 degrees, and has enough bite strength to snap a small boat in half - think about THAT next time a little kid bites your finger! In my office, we recently began using the Zooby Prophy Angles made by Denticator. One of the animals kids can choose from is a Zebra, which is why this story made me laugh. Who knew, Zebra's really are skilled dental hygienists! Full story from the telegraph. In related news, an Alaskan dentist (of the human variety) recently got a bald eagle back in the high life by repairing a damaged beak using temporary crown material and a yellow highlighter. This guy is like MacGyver, Steve Irwin, and, uh, a dentist all rolled into one bird-saving hero! Read about it in timesonline. Last week Jessica Simpson admitted that she doesn't brush her teeth. Instead, she occasionally opts to use Listerine and a sweater in her oral hygiene regimen. That's right, Listerine......... and a sweater. She hates the dentist. She didn't mention whether or not she hates ninjas, so maybe I'm still ok.
She was told she had three cavities, which she then let progress to the point of needing at least one root canal. With last week's lunch still stuck between her chompers, Jessica exemplifies my definition of "Ninjavitis" perfectly - deceptively bad breath that sneaks up on you like a ninja when you least expect it. In dentistry, as in any business, people will feel from time to time that they are being over-charged. Such was the case with UK resident Peter McShane who complained, was reimbursed for his expenses, but then for some reason decided that wasn't enough and took it upon himself to sabotage the dental practice. His methods included injecting the door locks with super-glue and stealing plaques off of the wall. (FYI - that's not the plaque removal we want you to focus on, Peter.) To top it off he left a fake bomb in front of the doorway one morning. The device consisted of a brick, some wires and a ticking alarm clock in a large box. The thing that makes this story so remarkable is that THE DUDE WAS 84 YEARS OLD! Closed-circuit security camera footage (which I would love to see) showed him dragging the box across the parking lot and taking a break halfway there. The news story says he took the breather because the box was so heavy, but I have another theory - he was 84! Read the full story from the Telegraph. And in this case, it can cause instantaneous tooth loss. Six to be exact. Because the cigarette EXPLODED! Although the Indonesian tobacco company apologized and compensated the victim the equivalent of $535 (that should cover six implants, right? ), I personally think this is a great idea. Most smokers are aware that the habit has severe negative impacts on their health - why put it off? If one out of every 100 cigarettes randomly exploded at some point, people might reconsider lighting up. Full story from the BBC News. Ninja Sword saves the day! Or, how about, not really? This news story started out as a brave teenager who defended his dog from the vicious and brutal attack of a mountain lion using a ninja sword! What a hero! When the local fish & game officer investigated he discovered the story to be absolutely true - that is, if you replace "mountain lion" with "raccoon". The dog in question? 1/2 German Shepherd, 1/2 Pitt Bull - a beast that no doubt needed the help of a sword-wielding teenager to protect it from the much smaller raccoon. Full story from KGO-TV in San Francisco. Here's another theory - the boy was telling the truth all along, but out of fear that the true power of a ninja sword would come to light, a band of REAL ninjas swept in after the incident and replaced all the cougar tracks with raccoon tracks! Ok maybe not "bullet proof", but this woman's recently acquired D-cup implants most likely saved her life when they slowed down the bullet, causing it to stop a mere 1 cm away from her heart! Hear me out - this story does have to do with dentistry. Sort of. The shooting happened in an L.A. area dental office where she worked. Full story from the L.A. Times. Don't bite your medals. You could end up like David Moeller, the German luger (not loser) who was so happy with his silver medal that he couldn't help but bite it, causing him to chip a tooth. Story from the Huffington Post. I'd recommend a nice "silver filling" to fix that one.